Since the Cave Bear was declared a National Treasure by Romania, no more of these fossils will be legally released from their borders. 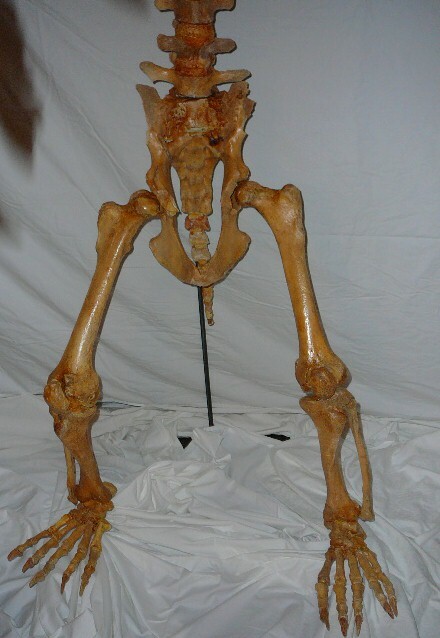 THIS IS ONE OF TWO OF THE LAST CAVE BEAR SKELETONS OUT OF ROMANIA, BEFORE THIS DECLARATION. We are pleased to offer you this generous selection with authentication papers, export papers & information card. LARGER than the Russian Bear, THIS IS A TRUE CAVE DWELLING BEAR from the Carpathian Mountain caves in the area of Brasov or Kronstadt, Romania ("Brasso" translation in Hungarian). Dated to the Pleistocene Era (42,000 to 100,000 years old). The male cave bear grew to 10 feet or more in length, and a weight of up to a ton (2000 pounds). Early discoveries of Cave Bear skeletal remains, found in the caves of Central Europe, were thought to be from unicorns and DRAGONS as well as bear. The bones of this European Cave Bear, considered to be of medicinal value, were pulverized and used in pharmacies for potions and elixirs. From 1920-1924, over 100,000 cave bear skeletons were taken from the Drachenhohle Cave near Mixnitz, Austria and used for PHOSPHATE and FERTILIZER - gee, what a waste of such unique fossils! Cave Bears have ever been offered for sale in this fashion. With the new year, we share with you our new pride and joy! We speak of the female Romanian cave bear that we have waited 2 years to acquire. Finally, we are able to reunite the two cave bears that we have procured. This is a unique feat, for the Cave Bear was declared a National Treasure by Romania, no more of these fossils will be legally released from their borders. So, now we offer this fine pair of Romanian cave bear specimens in their full beauty. Truly a once-in-a lifetime offer. Marvel at the awesome size of these massive prehistoric beasts. Fully assembled, Reinforced, on custom made wrought iron stand, posed in half standing up position. Front stand is adjustable to make the bear stand all the way up and or crouch down on all fours. 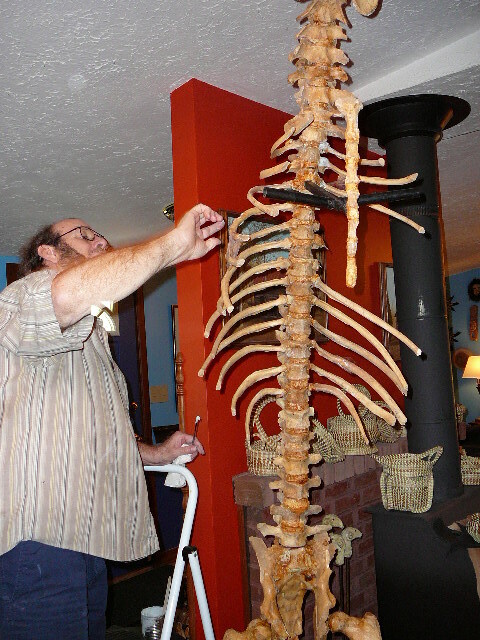 Arms, legs and torso come off for easy shipment; includes breastbone. Associated upper & lower jaws are open slightly (NOTE: many skulls are shown with the mouth open , due to the fact that they do not match - these do match, from the same bear). NOT A REPLICA, these are the genuine fossil cave bear bones. Purchased from a private collector in his possession for 15-20 years. Shoulder, rib cage, side view of legs. Closer side view of legs, front pelvis/legs, and feet. Fully assembled, Reinforced, on custom made wrought iron stand, posed at full standing height. 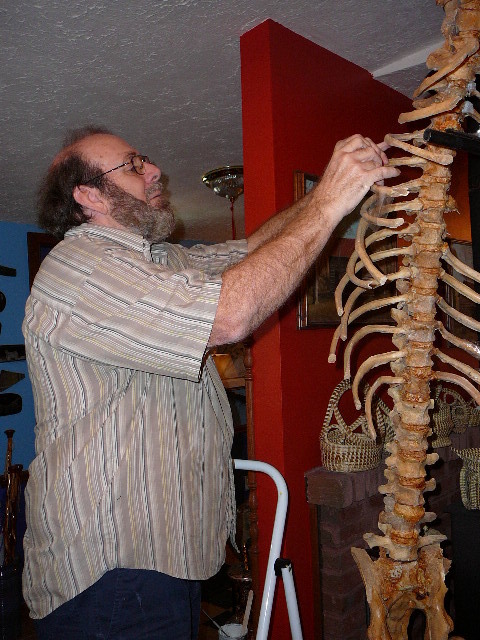 Arms, legs and torso come off for easy shipment; includes breastbone; feet start 4" off the floor. Associated upper & lower jaws are closed (NOTE: many skulls are shown with the mouth open, due to the fact that they do not match - these do match, from the same bear). NOT A REPLICA, these are the genuine fossil cave bear bones. Glenn is 5'10" tall, look at the height of this magnificent beast! Back of head, upper back/shoulders, lower back/rib cage. Lower back/pelvis, front pelvis/legs, back view of legs. Due to the fraudulent and illegal activities with other cave bear specimens, we will only supply our legal documentation for our cave bears at the time of purchase. It is with a very distinct amount of pleasure that I make my following intentions known to our loyal customers, friends and fellow business associates. I have reached a point in my life where I have had the pleasure of building a very successful business. My ever-growing curiosity over the past 38 years has led me to the far reaches of the earth, pursuing my dream of finding the strangest, most bizarre oddities that you see on our website. These past 11 years, Heidi has been involved in my business. Early on, our businesses were combined, creating another whole dimension encompassing many beautiful categories of things we have found from new travels together. So I have decided it's time to hand over the reins of this partnership to my lovely and capable wife Heidi, making her the sole proprietor of Where on Earth effective January 2008. I will continue to support Heidi, but in a much different role. This change in management will allow me more time to pursue other creative choices. 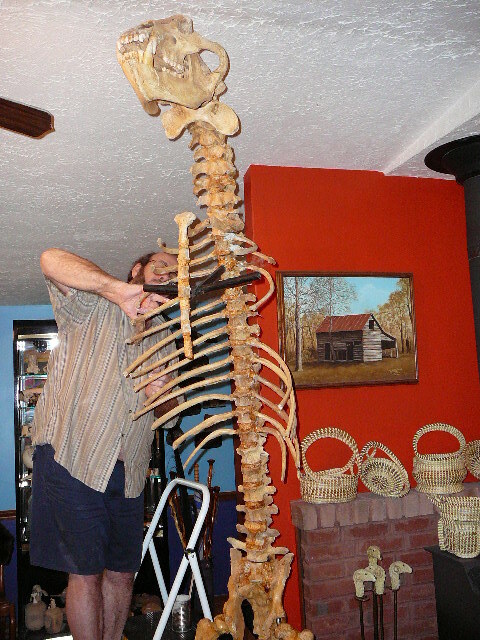 (Lest you think I will be idle, here I am restoring a gator skull, and our cave bear skeleton. This is like putting together model airplanes and cars I never got to play with when I was a kid). I hope you will join me in further support and interest in Where on Earth as we continue our travels to find the unusual, as well as educational endeavors. #CAVE-256 Measures 14" long x 7" wide x 6" tall. All original, top & bottom skull are associated. What a find! This is a monster-size Romanian Cave Bear skull. We challenge anyone to come forward with pictures & measurements of a skull larger than this. Associated jaws**i.e. belonging to the same bear. Note: usually cave bear skulls are posed with the jaws open--this is because the jaws will not fit together. Note the superb fitting of the jaws and the stable condition of this one-of-a-kind item we are proud to share. The Romanian export papers are included, provenance more than sufficient for purchase by any museum. Measures 20-7/8" long x 13-1/8" wide x 11-5/8" tall and weighs 13.6 pounds. Missing double root, 3/4” long x 5/8” wide x 3/4” tall. Oosiks of walrus, seal and raccoon etc. Carvings by renowned Northwest artist Eddie Lee (unless otherwise noted). Each item comes with Certificate of Authenticity, with his signature in black pen "EL". Eddie Lee is a self-taught artist whose love for nature found a permanent spiritual home in the Pacific Northwest. In his words, "Recreating the forms of Nature by using her basic elements is my way of celebrating and sharing the many gifts she has given me." Cave Bear Jaw CARVED WITH TWO CAVE BEARS is 14-3/8" long x 7-1/4" tall on fossilized walrus jaw bone base measures 10-3/4" long x 3-1/2" wide, total height of 9" tall. WEIGHT: 4 pounds.